Bring your own device (BYOD) and portable storage device use in the workplace significantly increase the likelihood of your business facing data leakage issues. GFI EndPointSecurity features risk assessment capabilities that identify assets possibly doubling as sources of data leaks. All functionality is built into a dashboard that provides relevant information, suggestions for boosting protection, and shortcuts to common security tasks. The data awareness module provides another layer of endpoint protection by scanning each relevant file and searching for the most common types of information susceptible to a security breach (e.g. SSNs, PANs, etc.). The module supports inputs in the form of regular expressions and dictionary files. It also contributes to your data loss prevention (DLP) and compliance efforts. From a single location, easily grant temporary network or workstation access to portable storage devices for a set period of time as well as block devices by class, file extension, physical port or device ID. When users connect to your network with a USB device containing unencrypted data, they are prompted to enter a password; GFI EndPointSecurity then encrypts all the contents on the device. After that, data can be accessed normally, with the added benefit of being encrypted using a strong AES 128-bit algorithm. GFI EndPointSecurity monitors the network, detects new computers that are connected to the network, notifies the administrator, and performs various tasks as configured by the administrator. The GFI EndPointSecurity ReportPack is a free powerful reporting package that adds on to GFI EndPointSecurity. It can be scheduled to automatically generate graphical IT level or higher level management reports based on data collected by GFI EndPointSecurity, enabling you to report on portable storage devices connected to the network, user activity, endpoint files copied to and from devices, and much more. Categorize computers into protection groups. For each group, you can specify the level of protection and permitted portable device access. GFI EndPointSecurity provides real-time status monitoring through its user interface. It displays statistical data through graphical charts, the live status of the agent, and more. USB sticks pose a significant threat to your business environment. They are small, easily hidden and can store up to 128 GB of data. GFI EndPointSecurity provides administrators with the ability to automatically schedule agent deployment after a policy or configuration change. 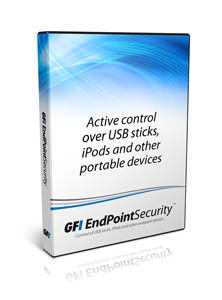 GFI EndPointSecurity enables you to grant or deny access to a range of portable device classes, as well as block files transferred by file extension, physical port and the factory ID that identifies each device. The agent used to control machines features a number of security elements to render it tamper-proof.